Obama File 89 Deepak Bhargava "Advancing Change in the Age of Obama"
Indian born, New York raised, Harvard educated, Deepak Bhargava may have seldom crossed paths with Barack Obama-but he is a key player in 44th president's movement to transform America. Deepak Bhargava is connected to almost every aspect of the Obama movement-from George Soros to ACORN, to Democratic Socialists of America, to The Nation, to the communist dominated United for Peace and Justice, to a whole raft of "progressive" non profits. In the video below, Deepak Bhargava opens the Heartland Democratic Presidential Forum December 10 2007 - a forum exclusively for thousands of community organizers including ACORN personnel. Note that Obama promises to invite community organizers to the White House even before his inauguration, to contribute to setting his "agenda for change". Deepak Bhargava's main base for activism is the Washington DC based Center for Community Change, (CCC) which he joined in 1994, after several years as legislative director for ACORN. Bhargava became the Center's Executive Director in 2004 and has successfully pushed the organization to develop the power and capacity of low-income people, especially low-income people of color, to change the policies and institutions that affect their lives. Deepak Bhargava has sharpened the Center's focus on grassroots community organizing as the central strategy for social justice and on public policy change as the key lever to improve poor people's lives. Bhargava conceived and led the Center's work on immigration reform, which has resulted in the creation of the Fair Immigration Reform Movement, a leading grassroots network pressing for changes in the country's immigration laws. He has spearheaded the creation of innovative new projects like Generation Change, a program that recruits, trains and places the next generation of community organizers, and the Community Voting Project, which brings large numbers of low-income voters into the electoral process. Helping Bhargava change America, is CCC board member Heather Booth, the former Students for a Democratic Society radical, turned Democratic Party power player. Booth runs the Midwest Academy out of Chicago-churning out hundreds of "community" and union organizers. Booth and her husband Paul, a labor union power broker, both have close ties to the US's largest marxist organization, Democrativc Socialists of America. Over September 20-22 2002 Frances Fox Piven, Deepak Bhargava and Holly Sklar were billed as keynote speakers at “Confronting the Low-Wage Economy” at the First Congregational Church-Washington, DC, organized by Democratic Socialists of America. This conference will kick off DSA’s Low Wage Justice Project, which is designed to bring the human consequences of the low wage economy to the attention of the American people. DSA member Frances Fox Piven is the co-author of the famous Cloward-Piven Strategy developed in the 1960s-widely used by ACORN, DSA and US "community organizers" ever since. The strategy calls for organizers to encourage the "poor" to enroll for every entitlement possible, in order to bankrupt the US government, to bring about chaos and eventual social revolution. In his speech to the conference Deepak Bhargava refered favourably to the work of DSA founder [Michael Harrington and his book "The Other America"-which is widely credited with sparking the massive growth of US welfarism in the 1960s under Kennedy and Johnson. Deepak Bhargava's radical ties extend in several directions. At the higher level, Bhargava is a board member at George Soros' Open Society Institute (OSI). On November 29, 2006 Bhargava participated in a roundtable discussion at OSI New York entitled "How Do Progressives Connect Ideas to Action?" Robert Borosage-A trustee of the far left Washington "think tank" Institute for Policy Studies and founder/CEO of Campaign for America's Future. Rosa Brooks Daughter of IPS Trustee and DSA member Barbara Ehrenreich. Now a senior advisor to the Under Secretary of Defense for Policy, Michele Flournoy. 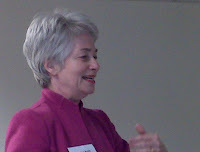 Anna Burger AFL-CIO, later a Progressives for Obama endorser and key player in labor union/Obama White House dealings. Katrina vanden Heuvel IPS trustee, The Nation editor. John Podesta Center for American Progress founder. CAP is a key source of "progressive" personnel for the Obama Administration. Joel Rogers Key DSA aligned "progressive" activist. A founder of the radical New Party which Obama joined in Chicago in 1995. As of July 17, 2007 Deepak Bhargava, Center for Community Change was affiliated with United for Peace and Justice-the US peace movement umbrella group. 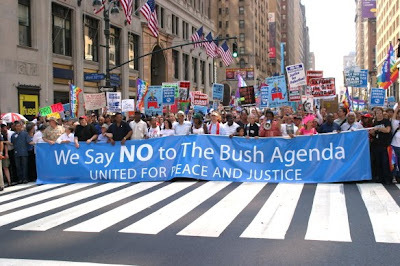 UFPJ was intiated to oppose the Iraq war by the Institute for Policy Studies . It is completely dominated by communists and radicals, which doesn't seem to bother Bhargava. Also leading organizations affiliated to UFPJ in July 2007, were Communist Party members Judith LeBlanc, Rosalio Munoz, Alfred Marder and Erica Smiley, Committees of Correspondence for Democracy and Socialism aligned activists Leslie Cagan, Attieno Davis, Howard Wallace and Van Gosse, DSA leaders Jason Schulman and Lucas Shapiro, Freedom Road Socialist Organization Maoists, Dennis O'Neil and Juliet Ucelli, IPSers Phyllis Bennis, Saif Rahman and Arthur Waskow and a very familiar name to readers of this blog-Van Jones of the Ella Baker Center for Human Rights. Bhargava serves on the editorial board of the The Nation--effectively the house journal of the IPS. Barbara Ehrenreich DSA member, IPS Trustee, New Party and Progressives for Obama founder. Lani Guinier Daughter of communist Ewart Guinier. Tom Hayden SDS and Progressives for Obama founder. Victor Navasky IPS Trustee, The Nation. Below is a video of Deepak Bhargava speaking at a The Nation forum in April 2009, on the prospects for "progressive" gains under Obama's "stealth agenda". On February 26 2009, Mike Lux, Miles Rapoport of Demos, Deepak Bhargava and Gloria Totten of Progressive Majority spoke at the Center for Community Change in New York at a forum entitled "Progressives in an Obama World: The Role of the Progressive Movement in a Democratically Controlled Washington". Miles Rapoport is another former SDSer, DSA associate, ACORN defender and ardent Obama supporter. Interestingly Rapoport became president of New York "think tank" Demos in 2000-while Obama was still a founding Trustee of the organization. Van Jones, incidentally is still listed as a Demos Trustee. Below is another Bhargava speech from February 2009, given to the Liberty Hill foundation "Advancing Change in the Age of Obama". Community organizers across the country congratulate the historic victory of one of our own and herald the role community organizing played in revitalizing participation in our democratic process. “Community organizing helped mobilize voters like never before with grassroots organizations engaging in electoral politics. Sen. Obama’s own campaign was modeled on the tools of organizing, building the national groundswell that got him to this moment. On December 4, thousands of grassroots leaders will host Realizing the Promise: A forum on Community, Faith and Democracy to lay out a strategy to work with President-elect Obama and the new Congress on the people’s agenda for change. Mild-mannered Deepak Bhargava is at the heart of the US social revolution. He and Obama may never have exchanged more than a few words, but they are assuredly working for the same future. Wow he sounds really cool. Wow he is really a malakas! You got a really useful blog I have been here reading for about an hour. I am a newbee and your success is very much an inspiration for me. Please come visit my site Business Reviews Of Miami City when you got time. for all the enthusiasm to offer such helpful information here. Please come visit my site Columbus Business Search when you got time. for all the enthusiasm to offer such helpful information here. Please come visit my site Free Local Business Directory Of Columbus City when you got time. I am trying to figure out what is good about this guy? Sounds like nothing at all!